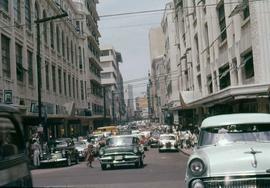 Colour Ektachrome 35mm slide depicts a busy street with many cars and people. Photograph depicts the CPR Pioneers' Train.Group of older people and a few children gathered on train tracks in front of an historic locomotive labeled "371" and the Coquitlam CPR Station. Photograph depicts the CPR Pioneers' Train.Group of older men and women gathered on train tracks in front of an historic locomotive labeled "371". Photograph depicts the CPR Pioneers' Train.Group of older women gathered in front of an historic railcar. Photograph depicts the CPR Pioneers' Train.Group of older men and women and a few children gathered on train tracks in front of an historic locomotive labeled "371" and Coquitlam Station building. Photograph depicts the C.P.R. Pioneers' Train at Coquitlam Station.Group of older people gathered on train tracks in front of an historic locomotive labeled "371". Photograph depicts the CPR Pioneers' Train.Group of older men gathered on train tracks in front of an historic locomotive. Photograph depicts a train at the Cameron Lake Station.Steam or diesel engine blowing steam in centre right of image with a crowd of men in front; two storey craftsman style station beside in centre left of image; tracks in foreground. 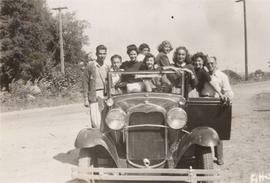 Photograph depicts a Camp Hatikvah group in Arthur Goldberg's 'Arts' Car'. Man on far left identified as Arthur Goldberg; Harold Lenett is second from left. Other copies available; refer to PastPerfect for details.